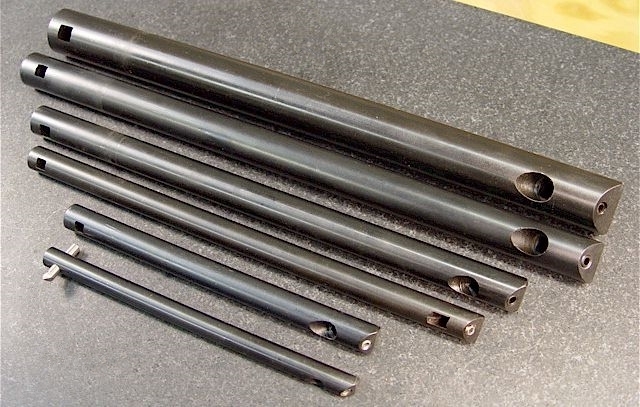 Borite boring bar set (USA) that uses TPMM22_ carbide inserts. 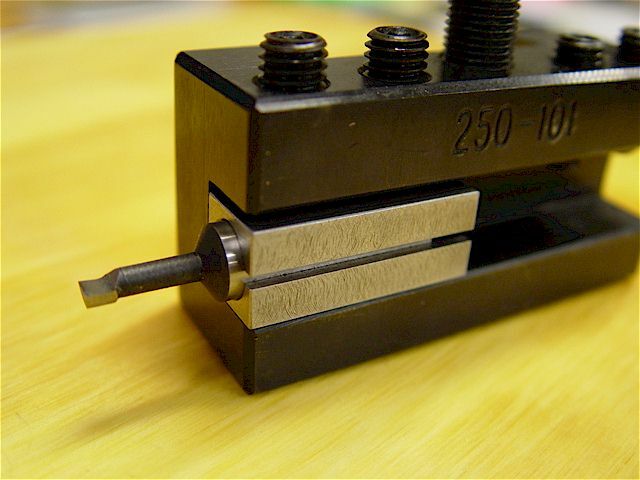 1/2" ground shanks. 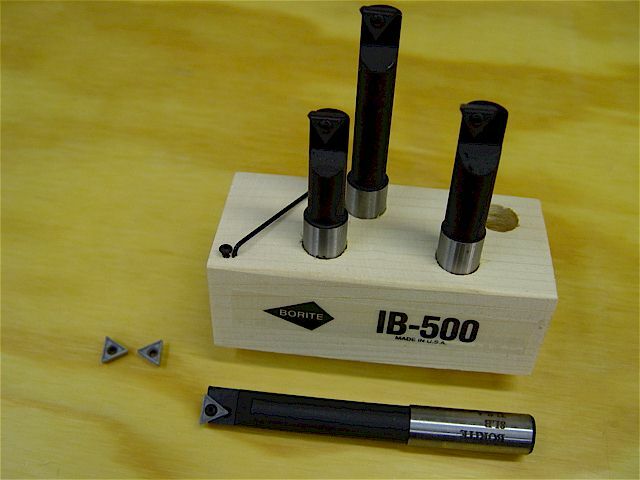 Carbide boring tool bit sets with precision ground 1/2", 3/4" & 3/8" shanks. 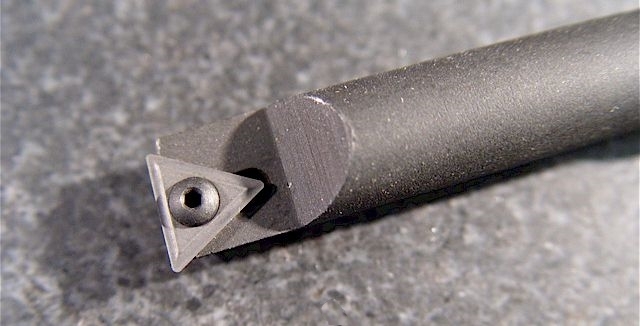 This quick change tool bit holder also has a V-notch to hold a round (3/8") boring bar shank. 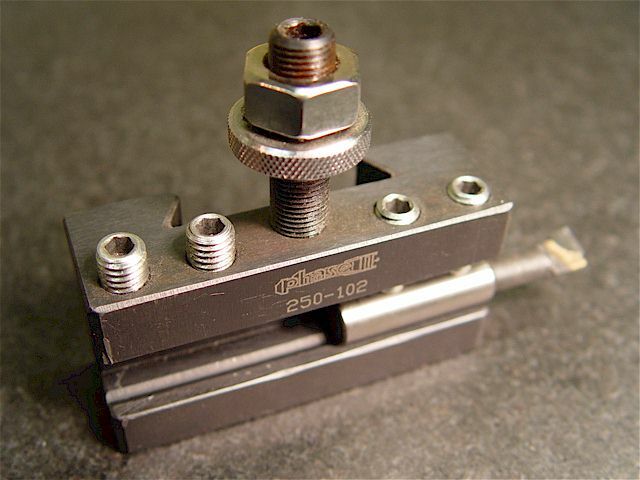 The set screws mar the shank making it difficult to insert into precision holders e.g., a boring head. 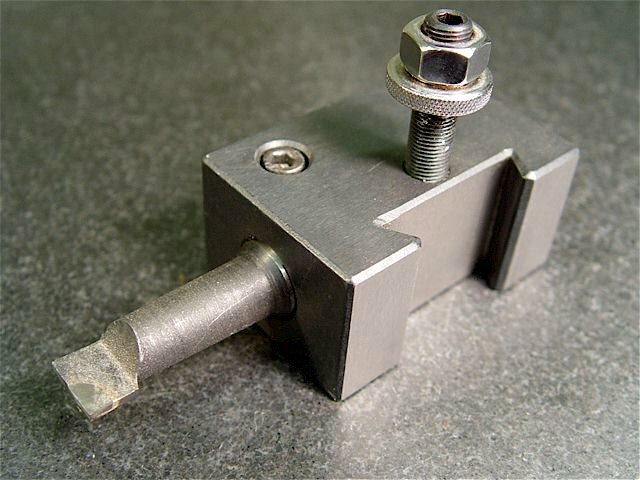 This AXA quick change boring bar holder holds a 3/4" shank tool. 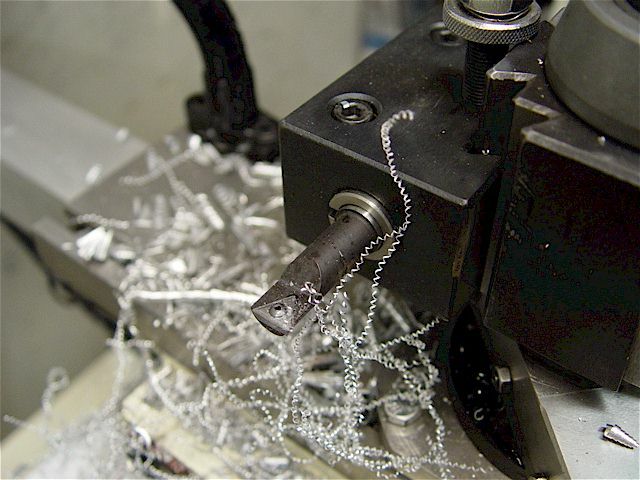 with insertion/removal when using a boring head. 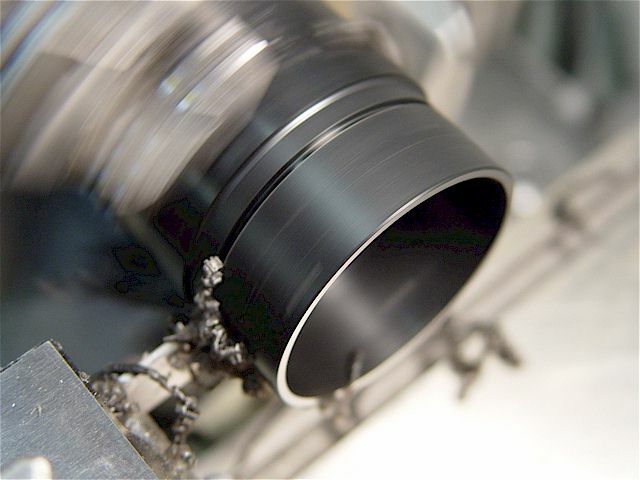 The hole was reamed for a close precision fit to a ground shank. 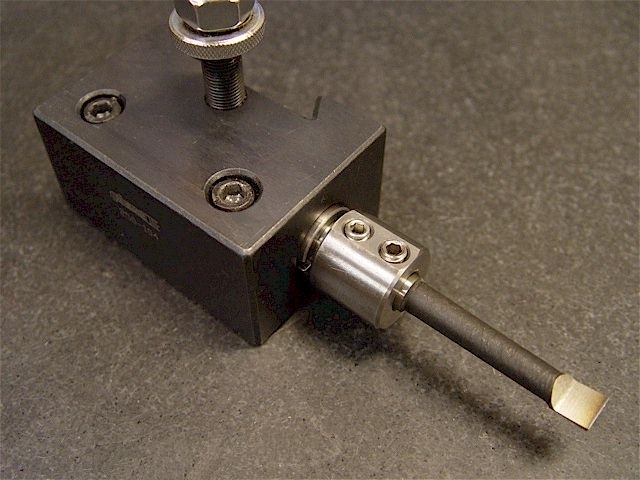 This supplied sleeve accessory adapts 3/4" to 5/8" shanks for the quick change tool post boring bar holder. 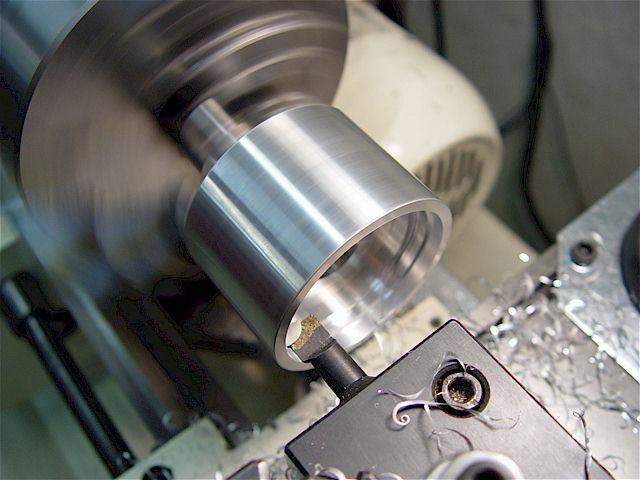 A 3" long, steel, 3/4" to 1/2" adapter. 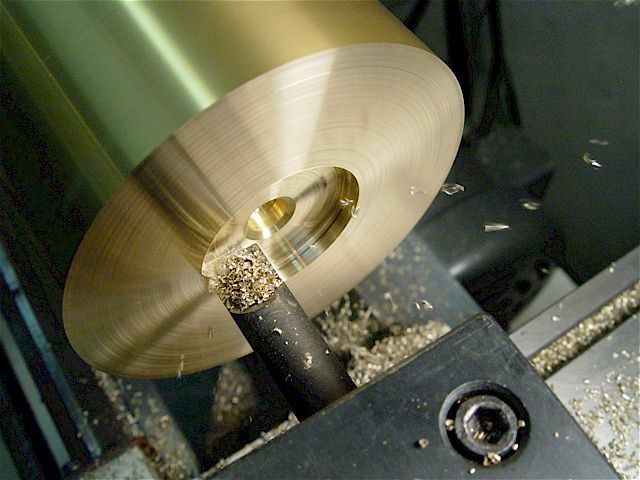 The hole was precision reamed & the single slit is 1/8" wide. 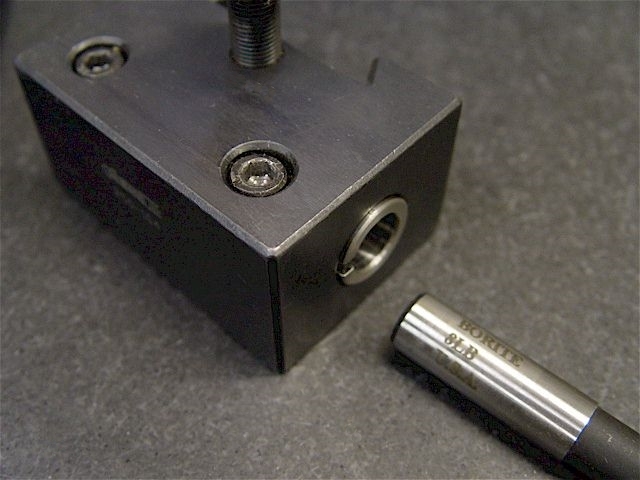 The left bolt clamps the adapter body while the right bolt clamps both the adapter & the boring bar shank. 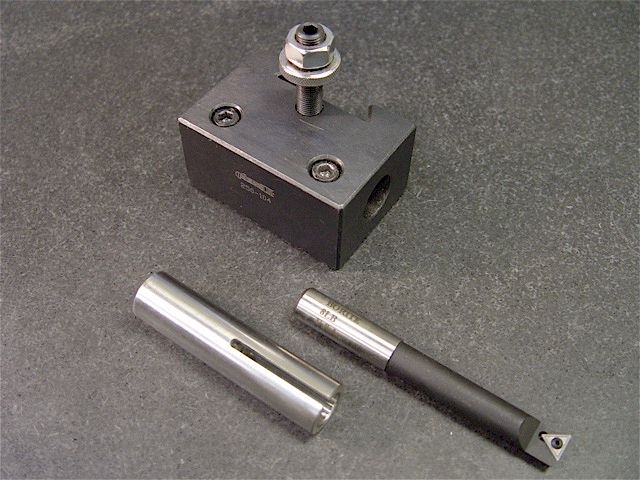 Rigid holder & excellent boring bar performance. 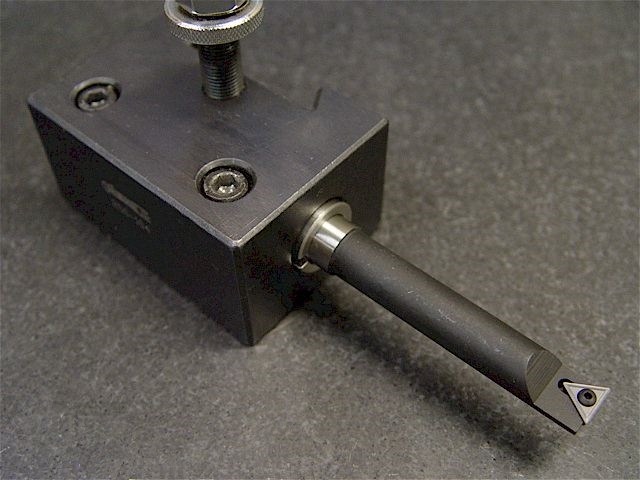 A 1/2" to 3/8" boring bar adapter can be added for even smaller shanks. 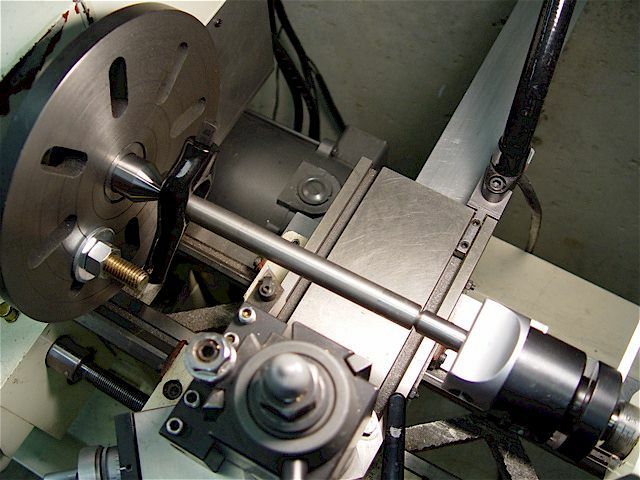 A 2" diameter boring head with an MT2 (screw-on) arbor can be used in the 9x12 lathe's tailstock. 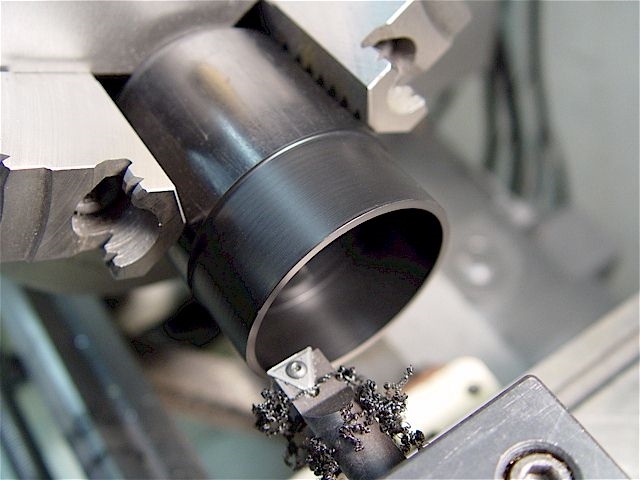 A taper cut is setup with the material held by two dead centers & driven by a faceplate with a dog. 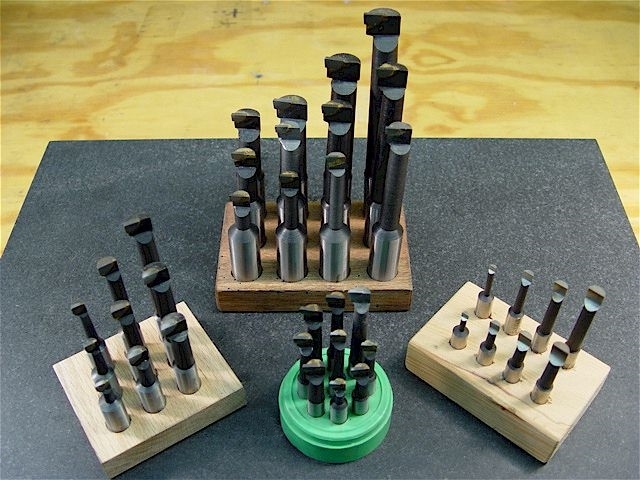 dimension then quickly removed a lot of ID material using a large 1-1/2" drill bit. Bored the inside dimension. 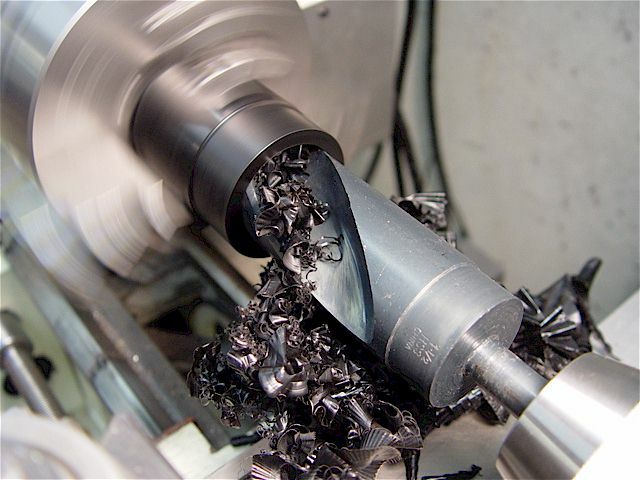 Delrin cuts smoothly & precisely. 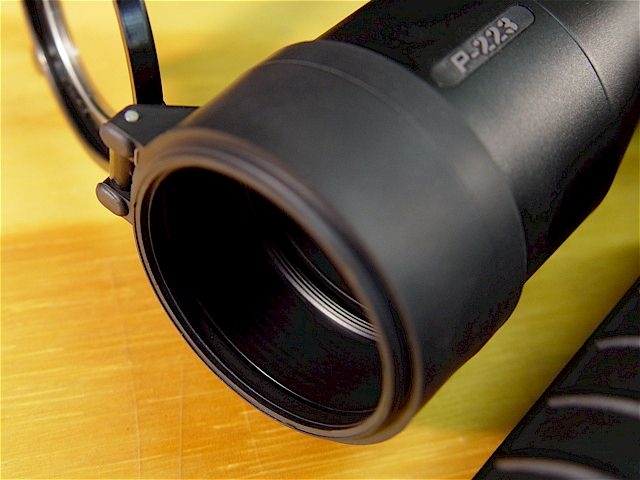 The cover is installed on the scope with the spacer inside. square bits. 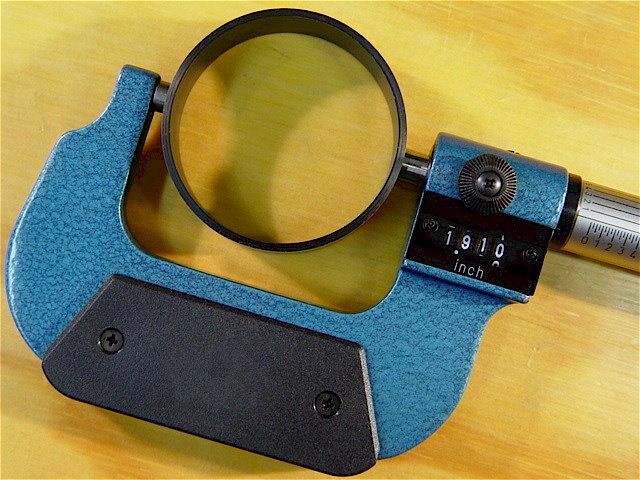 Each bar holds bits either perpendicular or at a 45 deg angle. Good for inside boring & inside threading.